With this week being all about Snowmass, we figured we’d take a peak at what the folks at Sundance Liquor & Gifts — opened in 1979 and locally owned by Barbara and Steve Wickes — recommend putting in your Snowmass Village schwag bag. BUY LOCAL: The Wickes are huge believers in shopping locally (in fact, they want to know why you shop/dine/buy services locally. Send an email with your thoughts to Steve@SundanceWine.com). 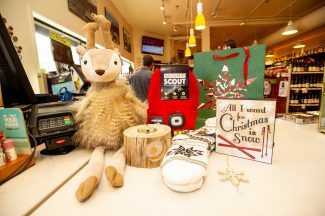 On this list of things to check out: beanies with a built-in LED headlamp, cozy socks and mittens, Christmas tree ornaments, unique stuffed animals and other Colorado collectibles. 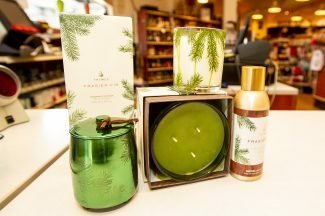 SCENT OF THE SEASON: Ahhhh, “the aromatic snap of Siberian Fir needles, heartening cedarwood and earthy sandalwood combine to create a just-cut forest fragrance that evokes warmth and comfort,” or so say the makers of Thymes Frasier Fir Collection. We took a whiff and agree whole-heartedly. CORKED: Everyone has a shot-glass souvenir from some type of resort-town vacation, right? 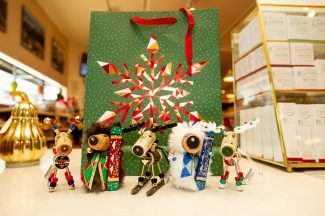 Here’s a twist on that classic: A wine cork, Snowmass-centric, holiday-themed knick-knack — think holiday gift exchanges, White Elephant parties, stocking stuffers, etc. Or, for an even nicer gift, shop for wine (and beer and spirits …) at Sundance; Barbara Wickes curates the collection, which is suprisingly extensive for a small-town shop such as Sundance.